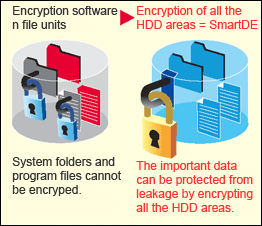 Toshiba Smart Data Encryption (SmartDE) goes beyond standard encryption – shielding every area of your hard drive, including all your system files, and your OS. Even if you remove your HDD, the files will still be encrypted. And if your PC gets into the wrong hands, they won't even be able to initiate start-up. So whatever brand of laptop you have, take your protection to a new level - install SmartDE. Encrypts everything – including your system files, your OS, and the files you share via email and USB Only encrypts a select number of local files – leaving potential OS and system file vulnerabilities. Requires pre-boot authentication, adding an extra layer of security against manual attacks Relies on PC integration for encryption, so once it's removed, it becomes a data-loss risk. Stays encrypted, even when removed from the PC, so even if it's misplaced, it remains secure Allows anyone to initiate startup, providing a gateway for hackers to exploit. Easy to install, so you can get protected fast. Complex setup and implementation that requires time and resources. SmartDE can request personal authentication prior to Windows startup. This restricts startup of the PC by anyone other than the user, preventing illegal use by third parties. By using the single sign-on function, Windows auto logon authentication and password synchronization between SmartDE authentication and Windows logon authentication become possible. Even if the HDD is removed from a PC, access to the data by third parties can be prevented by encrypting all the HDD areas. By encrypting the entire data in the system folders and program files of Windows, leakage of important information such as passwords can be prevented. SmartDE, which allows for the setting of encryption or non-encryption for each partition, enables the setting of non-encryption of hard disk such as recovery areas. Even if Windows is terminated while encryption is in progress, encryption can be continued at the next Windows startup. In addition, another software application can be used while hard disk encryption is in progress. Smart Data Encryption, which supports encryption of files/folders and USB removable media, enables safe data operation (flash memory and hard disks can be encrypted as USB removable media). SmartDE can encrypt data in file and folder units as well as the entire HDD. By using SmartDE for encrypting files attached to e-mails or shared files, data security can be ensured at transmission of important files through e-mail or sharing of files in a group. As the file/folder encryption supports a self-expansion mode, the recipient of the e-mail can decrypt and access the data on a PC without SmartDE being installed as long as the password is available. SmartDE can encrypt data in the USB memory and the hard disk that is connected to the USB. With the security measures such as prohibition of writing of data to un-encrypted media, SmartDE demonstrates the strength of preventing leakage of confidential data. A password can be set for the USB memory, enabling the exchange of data between the PC with SmartDE installed and the USB.